Researcher Kamal Meattle explains how an arrangement of three common houseplants, used in specific spots in a home or office building, can result in measurably cleaner indoor air. 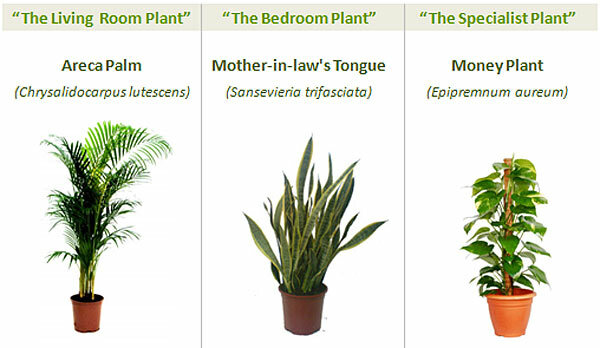 The three plants are Areca palm, Mother-in-Law’s Tongue and Money plant. Using these plants has a number of health and economic benefits. Health benefits include a reduction in eye irritation, headache, lung impairment, and asthma. The economic benefits point to an increase in human productivity in an improved environment, as well a reduction in energy requirements in buildings, because of a less need in fresh air. Areca palm is a plant which removes CO2 and converts it into oxygen. It’s recommended to have four shoulder-high plants per person and wipe the leaves at least once a week. Mother-in-law’s Tongue converts CO2 into oxygen at night. The recommendation is to have six to eight waist-high plants per person. The money plant removes formaldehydes and other volatile chemicals.